About 39 million people experience migraines in the US alone. Globally, this health issue affects about 12 percent of adults as well as many minors. Headaches are just one of the many symptoms of this neurological condition. So how can you know if your headache is a sign of this common ailment? Here are 6 symptoms that can indicate your headache is actually a migraine. We will conclude by discussing how upper cervical chiropractic is offering the hope of natural help for migraines. Migraine with aura affects about 20 to 25 percent of migraineurs. While this is not a common migraine symptom, it is one of the more obvious ones. Within an hour of the start of the headache phase of the migraines, aura occurs, including visual symptoms such as seeing spots, flashing lights, or bright lines. It is important to note that not every migraine has a headache as a symptom, and it is possible to experience aura without a headache. You may not associate your neck pain with your headaches, but it is actually one of the most common migraines symptoms of all. According to one study, 75% of those surveyed said that they experience neck pain during or before a migraine. The National Headache Foundation also reported on this symptom saying that 38% of migraineurs always experienced neck pain and another 31% had neck pain frequently. That makes two studies that reveal neck pain occurs with migraines more than 70% of the time. One of the most common migraine symptoms is that the sufferer has difficulty dealing with sensory overload. For example, bright lights, loud sounds, and strong smells may be overwhelming. Even normal amounts of light, sound, and smells may be more uncomfortable than usual. Not only are these migraine symptoms, but for many patients, sensory overload serves as a trigger as well. A common misdiagnosis is swapping out migraines for sinus headaches. The main reason is that people (sometimes even medical professionals) don’t realize that migraines can cause sinus symptoms. Most people who get a headache along with sinus pressure just assume it is a sinus headache and take sinus medication. However, if you regularly have these two symptoms together, you may be experiencing migraines. Even if the sinus medication provides some temporary relief, it is just covering up a symptom and not going after the underlying issue. Nausea is another one of the most common symptoms of a migraine. It can sometimes lead to vomiting if the pain and nausea are severe enough, but fortunately that symptom is not as common. Nausea is just one more indicator that usually causes a migraineur to retire to a dark room to lay down for a while when an attack strikes. This isn’t a symptom that occurs during the migraine so much as it does in the day leading up to the migraine. In other words, it is a prodrome phase symptom. This symptom has mistakenly led some to believe that certain foods are migraine triggers. How? The craving causes someone to eat or drink something decadent (red wine, chocolate, etc.) and then the migraine begins within 24 hours. Jumping to the conclusion that the food or beverage triggered the migraine makes sense – until you know that food cravings are a symptom. The craving is a sign that the migraine is on the way, not what causes the episode to begin. 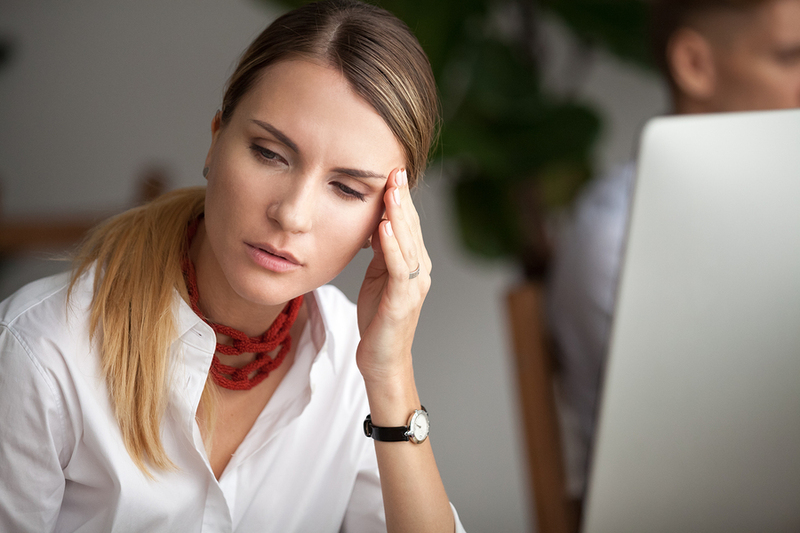 While this is just a small sampling of the many possible migraine symptoms, they are designed to help you see the difference between migraines and a run of the mill headache. Now that you can better identify the difference between headaches and migraines, it is important to know how to find natural relief from these and the many other symptoms that are part of a migraine. One way is to contact Atlas Chiropractic of Park Ridge in New Jersey. How can upper cervical chiropractic care help migraine sufferers? No doubt, you took note of the fact that neck pain is one of the most common migraine symptoms. With that in mind, it makes sense to check the neck for a possible underlying cause of migraines. For example, an atlas (C1 vertebra) misalignment can affect blood flow to the brain, brainstem function, and even lead to intracranial pressure. These can all play a role in the onset of a neurological condition such as migraines. At Atlas Chiropractic, we employ the Atlas Orthogonal method of upper cervical chiropractic care. It involves a very gentle adjustment made with an adjusting instrument that is probably unlike any other chiropractic adjustment you have ever experienced. There is no cracking or popping of the spine. The low force adjustment is designed to be long-lasting and to give the body the time it needs to heal from any damage that was being caused by the atlas misalignment. If you are suffering from migraines, especially if you are experiencing neck pain or have a history of head or neck trauma, we encourage you to schedule a consultation to learn more. Call us today at (201) 476-9191 to set up an appointment, or you can submit our contact form. We look forward to hearing from you and helping you to see how upper cervical chiropractic care is assisting patients to acquire better overall health and well-being, including less frequent and severe migraines.